I wrote a few weeks ago about The Next Harry Potter and whined a little about wanting to read a book that made me feel the way I felt the first time I read HP & the Sorcerer’s Stone. While Henry Neff’s Hound of Rowan isn’t exactly that, it sure comes close. During an annual museum trip with his Dad, Max McDaniels discovers he has potential. But his “potential” is not your normal everyday kid potential. Nope. Max’s potential is magical, and a chance encounter with a golden threaded tapestry in the museum opens up a whole new world for the boy. Max eventually ends up at Rowan, an exclusive school for other Potentials, but not after being attacked by an odd little woman with hard, sparkly eyes. Once at school, Max discovers a number of pronounced talents — he can Amplify like nobody’s business (picture Superman’s quick trip around the Earth to turn back time when Lois dies on that highway in Superman: the Movie) and bears an odd similarity to Cuchulain, the Hound of Ulster from Irish mythology. As expected, a darkness is rising, and Max and his roommate David appear to be the duo that will save the world. Despite their efforts, however, the Darkness (in this case, Astaroth) does rise again, opening the door for more adventures. The Hound of Rowan is awash in mythology, both modern and ancient, and Neff pays tribute to Those Who Have Gone Before. 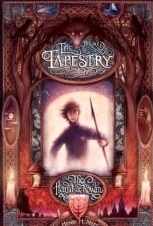 There are plenty of similarities to Harry Potter — the impetuous boy destined to save the world, the magic school, odd creatures, the village sweet shop — but there is a welcome and refreshing blending of imagery from other sources as varied as The Dark is Rising, Half Magic, The Mabinogion, Star Trek, Tron, and even Bedknobs and Broomsticks! I was particularly taken with the “Courses” students are required to master that use a concept similar to Star Trek: the next generation holodeck mashed up with the psychedelic bing-bing of Tron. The courses run “scenarios” that teach the students things like strategy and agility. And of course, the obligatory school sports game — not Quidditch but Euclidean Soccer — played remarkably like the soccer game on the Island of Naboomboo in Bedknobs & Broomsticks. The copy I read was an advanced reading copy, and as expected there were a few things that needed to be fixed. I hope the final version provides a better characterization of David, Max’s roommate, as well as the backstory for Ronin (think Sirius Black). On the whole, however, Hound of Rowan is a total and complete romp, well worth your time, and highly recommended for grades 4 and up. If anyone would like to reach me this is a better email. I really like the series. I cant wait for the third book to come out. I just got finished reading the first and second book over again. I am a big fan of the book. My son is reading this now and loving it.